Monday is here, and a brand new work week is about to begin! The weekend was a lot of fun, but who says that the fun has to stop just because it is a Monday? One of the most beloved comic book characters ever is Spider-Man. The story of Peter Parker is pretty simple, and he got his great ability to climb up the side of buildings is thanks to a radioactive spider bite that turned him into a super hero! 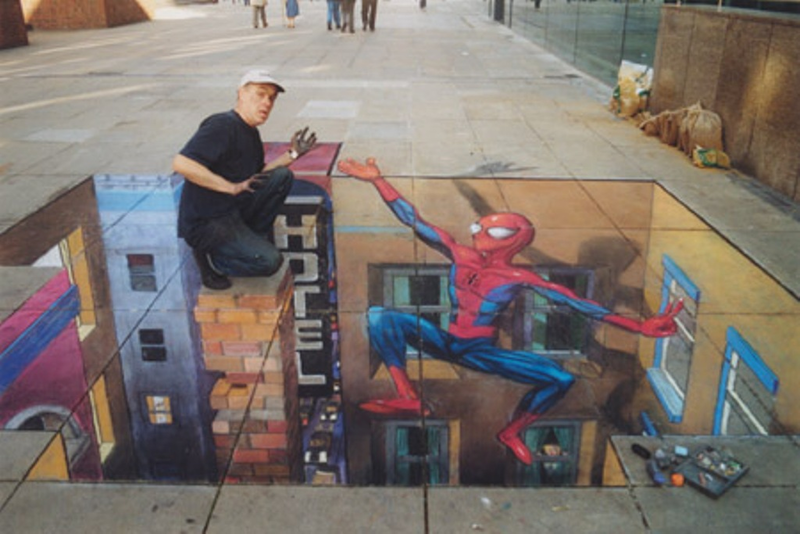 Take a look at today’s optical illusion, and you will see the webbed wonder back in action once again coming to the rescue of the man that drew him on the sidewalk. Since Halloween is coming up, ready for an optical illusion that might make you all… scream? Take a look at this screaming eye optical illusion, and the pupil being a mouth is enough to make anyone get the shivers! While some optical illusions can be easy to figure out, this screaming eye illusion is pretty tough to figure out, but it is still pretty terrifying jus the same. Well, today is Monday, and hopefully, these two illusions will bring a smile to the faces of all you that have to work today. Have a good Monday!